For years, Canadians have been accidentally eating raw chicken. The problem? They’re confused by frozen breaded chicken products which have a misleading ready-to-eat quality along with fast food names — nuggets, cutlets, strips and fingers. The pieces come out of the box looking cooked because the batter is quickly par-fried at the factory so it will stick to the pre-formed meat. But lurking beneath the golden breading is raw chicken that is potentially contaminated with salmonella bacteria. “Consumers know how to treat a raw chicken drumstick, by and large. They know how to treat a boneless chicken breast, by and large. But this product looks different, and that’s been the issue,” said Robin Horel, president of the Canadian Poultry and Egg Processors Council. It’s a health risk that hundreds of Canadians have discovered the hard way. As of last week 566 people had been diagnosed since May 2017 with salmonella infections linked to frozen breaded chicken products, and 95 of them were so sick with fever and diarrhea that they had to be hospitalized. Three people with salmonella infections have died. “It is a known risk in a food product that we have seen hundreds of people become sick with across the country over a period of years,” said Bonnie Henry, B.C.’s provincial health officer. Health officials estimate that there could be another 26 unreported infections for every known case. That means thousands of Canadians might have been sickened by salmonella contamination from frozen breaded chicken products. The Canadian Food Inspection Agency (CFIA) “has been slow, in our opinion, to really get on this, and we’ve been petitioning them for two years now to do something about this,” said Henry. Last fall Canada’s medical officers of health were so concerned they took the unusual step of releasing a statement warning Canadians about the food poisoning risk. “It didn’t get a whole lot of pickup, and these outbreaks continue to happen. We had a notification just last week of another one, ” said Henry, who is also the chair of the Council of Chief Medical Officers of Health. 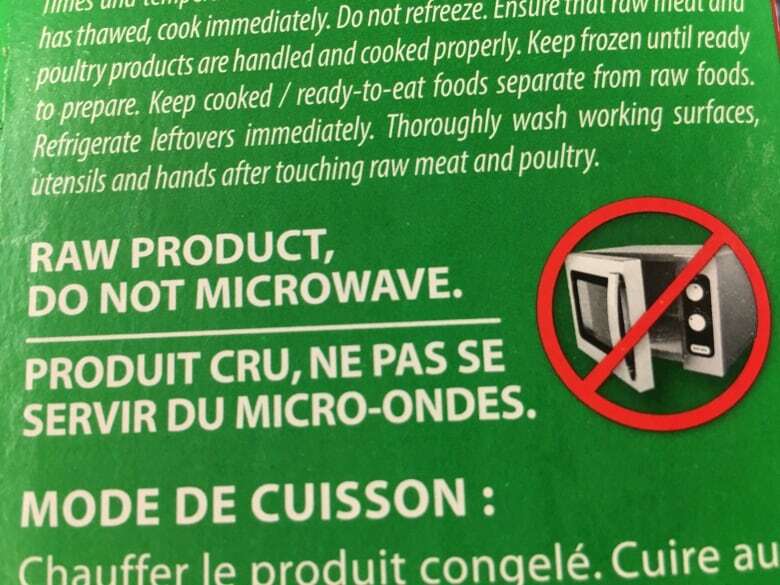 Manufacturers have added the words “uncooked” and “raw” to the product labels along with cooking instructions and warnings not to use a microwave because the heat is too uneven. Recently the industry began listing the cooking instructions on the inside bag because they realized people were tossing the boxes to conserve space in their freezers. Still the infections continued. There have been 17 investigations and 13 government-ordered recalls of frozen chicken products across Canada over the last two years. “For somebody who is in a hurry and buys a convenience product out of the freezer, reading the cooking instructions often is not front and centre in their mind,” said Martin Appelt, senior director in food safety at the CFIA. So last spring Canada’s food regulators finally decided it was time to try a new strategy. The CFIA gave the industry one year to change their processing and get rid of salmonella in breaded chicken products headed for the grocery store. The deadline is Monday. After April 1, there can be no detectable levels of salmonella in frozen breaded chicken products destined for household freezers. Restaurants can continue to use uncooked breaded chicken products. “The food service industry, because of the additional layer of protection that they have by employing trained personnel and having kitchen and cooking rules in place, they can still receive a raw product,” said Appelt. Although the CFIA gave processors several options, including more stringent testing, most of the companies have decided to simply cook the chicken before it leaves the factory, installing giant cookers, a multimillion-dollar expense. Meanwhile, existing inventory will remain on the shelves and available for sale. “We do expect that product manufactured prior to April 1 will be in the marketplace or in consumers’ freezers for a while,” said Appelt. He says it is a popular product so the turnover in inventory is high. “It is not an unsafe product. You just have to cook it,” said Appelt.